Help me give a warm, InspyRomance welcome to Jessica Keller! Jess is one of my dearest friends and my NovelSista (okay – that doesn’t mean a whole lot to most people, but trust me, it means something – like I imagine a sorority or something might ;)). I’ve been contemplating what to post today for quite some time, but today is a bummer day for me – it would have been my mom’s 69th birthday. While it doesn’t hold the sting it used to, and my kids and I have cake to celebrate (mmm… cake! ), it’s still a bit tough and it was hard for me to come up with a good topic. Jess to the rescue! She has a new Love Inspired book out (fireman!) and also has some non-Contemp-romance books out – both a contemp/historical combo and a YA – LOVE them both and can’t wait for the sequels! Check them out on her Amazon page :D.
The question I find most often in my inbox from readers is: How do you come up with ideas for your books? So I thought it would be fun to walk through a thought progression of how my latest book came from a quick idea. What I like to call: seizing a moment. Tucked near my house is a little, white clapboard church that looks like it belongs in a Hallmark movie, doing double duty as a one room schoolhouse. Headstones in the cemetery beside it date back to the 1800’s. And the name? Church of the Big Woods. Does it get quainter than that? I think not. Each morning as I drive to work I look forward to seeing the church. Watching the leaves change around it. Smiling as it stands proud, like a sparrow refusing to fly south for yet another snowstorm. A few years ago, very early on a winter morning, I passed the church as the sun rose behind it. And I gasped. I had to pull over on the side of the rode and just stare. Brilliant orange-pink light hit at just the right angle to illuminate just the church—making it shine in the midst of the woods. Sunlight streamed through century old stained glass windows. And the worst thought ever hit me: It looks like the church is on fire. That’s all it took to plant a new story into my head. This happens to many writers I know. A thought like this happens, and we hold onto it and keep asking questions. The entire rest of that week they zinged through my head. Why would someone set a church on fire? What if someone was in the church when it was on fire? What if the person who set the fire didn’t know about the person inside? What if they were kids? What if they crossed paths later and fell in love—not knowing that one had set the fire that caused the other to suffer third degree burns? What if the guy who set the fire became a fireman as a way to atone? What if they both got dragged into rebuilding that same church more than ten years later? Talk about a lot of tension in a story already…and I didn’t have the characters’ names yet! Authors seize the moment by noticing little things and asking questions, but I’ve found this can be really powerful in other parts of life too. The lady at work who is suddenly quiet when she used to always be cheerful, see her? Something is going on. She needs us to ask questions and offer encouragement. She needs someone to notice. When your son comes home from school and goes straight to his room and doesn’t emerge even after cookies come out of the oven—ask questions and seize that moment. Out for a walk and spot one courageous flower poking through the still cold earth of pre-spring. Stop and seize that moment. God’s letting you know that flowers bloom even when the world feels like it will never be anything but gloomy. Life is a series of moments. Don’t miss them. Care to share a moment from your past week? Or ask a question about how authors get their ideas? I’d love to hear them. Two people who leave comments will win the first two books in Jessica’s Goose Harbor Series (The Widower’s Second Chance and The Fireman’s Secret). Winner will be announced 3/15/15. Carol again! Jess has been telling me about this book for like… years now! I read the first couple chapters eons ago and the paperback is staring at me every time I walk through the library. Ah! It’s tops on my TBR stack when I can breathe again and the monumental tasks before me are but fond (or not so fond ;)) memories. I CAN’T WAIT! Jessica Keller holds degrees in both Communications and Biblical Studies. She is multi-published in both Young Adult Fiction and Inspirational Romance and has 100+ magazine and newspaper articles to her name. Her latest release is The Fireman’s Secret. She also has a speaking ministry and loves to talk books. Jessica lives in the Midwest with her amazing husband and their very giggly daughter. Connect with Jessica through her Website, blog, Facebook, Amazon Page, Pinterest, and on Twitter. Thank you for this post. This sounds like a great story. I would love to win a copy. Thanks for stopping by Susan! They’re both great stories! Thanks! The Fireman’s Secret holds a special place in my heart. Joel’s story really got me! Thanks for stopping in Dana!!! I am always amazed at the way an author can turn an idea into a story. I love hearing about those moments when a story is born! Thank you for sharing this great post. I am eager to read The Fireman’s Secret! Those why questions lead to so many fun places! It’s so fun to hear how it happens for other authors! Sometimes I’m not even sure how it happens for me :p.
I loved hearing how you came up with the story for “The Fireman’s Secret”. It sounds good :) I’d love to win. Thank you Samantha. I am following him on Amazon now. I really enjoyed your book The Fireman’s Secret. It was quite interesting how the lovely sight of the church helped you come up with the idea for your book .Don’t want to spoil how you used the idea in the book. Looking forward to reading The Widower’s Second Chance. I would love to win The Widower’s Second Chance. I’m so glad you enjoyed The Fireman’s Secret! Thanks for letting me know. I’m so glad you liked it Nancy!!!! I have to say it’s amazing how your whole book was inspired by this little though beautiful sight. It’s an amazing story behind what sounds like a great book. The sky is such a beautiful gift from God. Sunsets and sunrises are such beautiful things. For Christmas I bought my sister a star finder (it’s a tool to find specific stars depending on the time and the date, since the sky changes depending on those variables) and we went out a couple of nights to look at the stars. I had never really done that before, but when you look up at the sky at night it’s so beautiful. I catch myself looking at the skies at night sometimes ever since that and every time I am amazed by the beauty of it all and thank God for everything He gave us. I loved this moment you shared. I love star gazing. Thank you so much for sharing it with us! I’m going to have to look up a star finder! I bet my kids would love it! I’m sure your would love it! You can find some good ones on Amazon. I bought might at a gift shop in a science center and it cost about 12$. But I have seen some on Amazon that are even cheaper (about 6$), just make sure you have one for the right Hemisphere (either North or South) and that there is a wheel so you will be able to set it at the right time (I saw some that don’t have a wheel so it only shows a part of the sky). This tool is also called a Star Wheel (it might ease your search). I’m thinking I may have an Easter gift for my kids :D.
This link isn’t live yet [should be sometime today – at least I PRAY this is the right link, but it should be] – ALONG CAME A PRINCE is up for preorder at a special sale price of .99 on Amazon! Jessica, Thank you for posting for Carol. 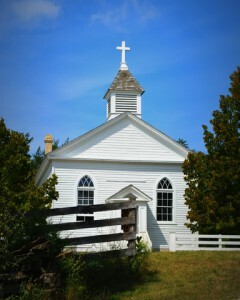 The church you drive past everyday reminds me of the community church and school,where my Mom grew up. I would love to read your books. Carol,I know how you feel,I miss my Momma. The last week for me has been full of snow and sleet and I woke up to sunshine this morning. God is good. God is good! I’m so glad spring is around the bend! 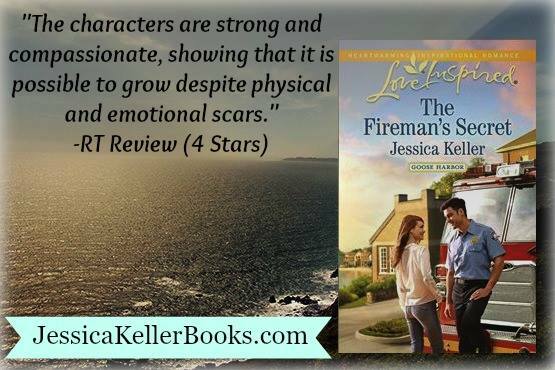 I am currently reading “The Fireman’s Secret” to review for Jessica. I’m almost finished with it, but it has taken me longer than normal to read. Just so many things come up in life sometimes! But I promise, I am almost done with it. Hope to have the review done sometime on the weekend! :-) I really enjoyed learning how you came up with the storyline. It sure adds to the book! Thanks for sharing that. I would love to have “The Widowers Second Chance” to add to it & would gladly pass it on to my sister-in-law who is also an avid reader! Thank you for coming on the blog today to share about your book & for a terrific giveaway! And for encouraging us to connect with people who are hurting. We really should do more of that! Blessings to you Jessica & Carol both! I signed in with my wrong email address…it should be teamob4 (at) gmail (dot) com…sorry about that! Trixi what a WONDERFUL moment! We just celebrated my daughter’s second birthday and it is always such a joy to be surrounded by family. Thanks for stopping in, Trixie! I’m so glad you’re enjoying it! I love first birthdqays!!! Great interview. I love reading about how authors get their ideas. Thanks for stopping in, Tina! It is great fun, isn’t it? !